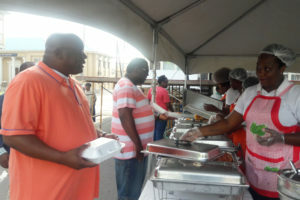 BASSETERRE, ST. KITTS, August 6, 2017 (PLP PR Media Inc.) — The National Political Leader of the Peoples Labour Party (PLP) Dr the Hon Timothy Harris has said that the massive show of support for the benefit breakfast put on by the party’s Women’s Arm on Saturday August 5 at the Shoreline Plaza in Basseterre underscored the commitment the country has to its school-going children. 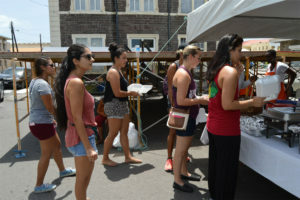 “When members of the PLP Women’s Arm arranged to host this fundraising breakfast, their intention was to raise funds to assist children returning to school in the academic year 2017/2018 to get school supplies,” said Dr Harris who is also the Prime Minister of the Federation of St. Kitts and Nevis. He commended the Women’s Arm of the Peoples Labour Party for the advocacy role they are playing in solidarity with the Federation’s children saying that the fundraising breakfast on Saturday August 5, which was dubbed ‘Power of Women Breakfast’, was the second such event organised by the women of PLP. The first one was organised by members of the Peoples Labour Party (PLP) Branch #7 Women Empowerment Group who held their fundraising breakfast on Saturday June 3 outside Bourryeau Gate in Constituency Number Seven to assist parents with children who were graduating from the four primary schools in the constituency. Attending the event included PLP’s Deputy National Political Leader Senator the Hon Akilah Byron-Nisbett, National Secretary Ms Myrtilla Williams, Deputy National Chairman Mr Craig Tuckett, Deputy National Secretary Mr Christophe Greaux, and two representatives of the PLP Youth Arm Mr Manasses Huggins and Mr Damian Weeks. They were also joined by the National Party Organiser Mr Alexis Nisbett, PLP Founding Member Mr William Phillip, and Ambassador His Excellency Michael Powell. Others from the various PLP Constituency Branches included Mr Cante Bowry, Mr Nubian Greaux, Mr Philemore Bedford, Mr Grenville Mills, Mr Lenworth Harris, Mr Wendell Wattley, Ms Petrona Thomas, Mr Clive Jr Nias, Mr Eugene Dias, Ms Renée Taylor, Ms Carla Johnson, and Ms Marsha Lewis among others. The two representatives of the PLP Women’s Arm, Ms Tishanna Norford and Mrs Sonia Henry, said they were overwhelmed by the support their received from the constituency branches of the Peoples Labour Party. 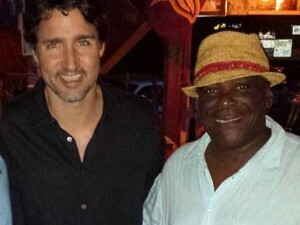 People from all walks of life and from the different constituencies in St. Kitts came to support the philanthropic cause that was spearheaded by the Women’s Arm of the Peoples Labour Party. There was also goat water on offer and those who came in the late morning enjoyed it. The event ended at 12:00 noon, and the PLP’s Deputy National Chairman Mr Craig Tuckett was there throughout the entire period to ensure that all went on smoothly. 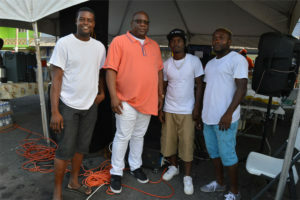 He said that he was impressed by the orderly manner the event was held and thanked the Selector Nails Music System who played gospel music that appealed to those attending the event. “From the overall support that we received today in our efforts to raise funds to assist children get school supplies, it is without doubt that the Peoples Labour Party is becoming a formidable force in the Federation’s political arena,” said Mr Tuckett.